iPhone Savior: Is There Life After A Cracked iPhone? Is There Life After A Cracked iPhone? LOS ANGELES, CA - Since last Thursday, living with a cracked iPhone has become an unpleasant reality for Greg Mote who manages his own industrial design firm in Los Angeles. While checking in a shipment of boxes using his handy iPhone notepad, Greg's phone slipped from his hands and landed face down on what he describes as very rough gravel. Greg has tried to remain unaffected by his recent iPhone tragedy, but those scars are hard to ignore on an iPhone he has been obsessed with for three months. "I've dropped my iPhone about five times but it had always landed on it's side with no damage done," said Mote "This time I was not that lucky." Mote intends to use his cracked iPhone as long as he can before he's forced to fix it. "A few shards of glass popped out at first but it doesn't seem to be losing glass anymore. The screen interface still works perfectly though, it's just a little rough on the fingertips. Now it's hacked and cracked." The DIY replacement screen will cost Greg $119 or he can send in his iPhone to PdaParts.com for full service screen replacement at a whopping $199 and be without his iPhone for five to seven days. PdaParts.com warns that any DIY method will void the Apple warranty. They have provided a handy instructional video for those who want to brave the DIY path. You won't find Greg Mote standing in front of a black backdrop recounting his torrid affair with a crazy French Canadian, but that doesn't mean his iPhone story is any less real to him. For Mote, one day with a cracked iPhone is better than seven days of waiting with no iPhone at all. Any tips for Greg on replacing his iPhone glass? Add it in comments. Greg Mote on (left) in his happier un-cracked iPhone days. Having to fix a cracked iPhone screen is upsetting because it costs a lot of money and it leaves you without your phone for a little while. The best answer is to protect your iPhone! I came across this website, http://www.iphonebatterypack.com, which has iPhone battery cases which fit snugly onto your iPhone just like a protective case while simultaneously boosting your battery life by two or even three times! I found a place: http://www.netefx.net. The people at NETEFX fixed the cracked screen on my 3GS for $79 and had it done in just under an hour. I was going to just mail it to them but they were not that far away and I didn't want to be without my iPhone for more than a few hours. My iPhone looks and works perfectly....they too had a 1 year warranty. They replaced my iPhone 3GS screen in 15 minutes, and my iPhone was just like new, AMAZING!!! Highly recommended, they told me they get iPhones from all over the US and it only takes 2-3 days to have your iPhone back. If you're as lucky as me and live in Los Angeles, California, you'll get this local service done fast and done right. They even gave me a 90 day warranty and I payed much less than half what Apple was asking for the cracked screen repair. Can i replace the 3GS glass/digitizer w/ the old iPhone glass/digitizer? I think I bought the old iPhone in 2007. I cracked my iphone screen. Can you fix it?? I live in Valencia Ca.contact me at 805-827-1012 if you could please ASAP! I recently tried this repair on my own only to find myself in very high water. I broke my LCD, my digitizer and my charge port in the process. Thank goodness for http://www.iphone3gscreenrepair.com. They had my phone repaired and back to me in less than 48 hours. I cracked my iPhone 3g screen and got it fixed in 15 minutes by the guys at http://www.ifixnow.com while I waited in their business center. All done on-site in Los Angeles, awesome. OK. I finally got around to getting my screen repaired by http://www.crackedphonescreen.com . They did a great job and looks like new and I am extremely happy with the work he has done. I recently dropped my iPhone and cracked the screen. I was very upset to find out my Apple care would not cover this. I was about to pay Apple $199 for the repair until I found http://www.iphone3gscreenrepair.com. They repaired my cracked iPhone 3G glass + digitizer for only $75. The best part is that they fixed it the same day they got it! I had my phone back 48 hours after I sent it in! I was about to pay for apple to repair my cracked iPhone 3G until i found iphone3gscreenrepair.com. They offered the service for only $75 and it even came with a 1 year guarantee! Very happy with the repair they performed for me! My iPhone was less than 90 days old, when my iPhone glass started to crack near to the earpiece. I used my iPhone for over a week since the first crack, but the screen continued to crack. Apple priced the repair at $199., even with the manager's input. The glass was beginning to escape like sand, out of the plastic keyboard protector. I felt I had nothing to lose, so I looked up http://ubreakifix.com/flash.html and called 1 877 224-4349. I live in Orlando, where the repair guys are located. We made arrangements, and my phone was fixed in less than 15 minutes: $79.99. He fixed my son's iPhone as well. The Drama is over! My iPhone is like new! Thank you Carlos! If you have a 3G, and only the glass is cracked but the LCD works (like the one in the picture at the top), you only need to replace the digitizer and glass, which you can get for about $25 on eBay. It is an easy pop-out/drop-in replacement and there are good videos of the process on YouTube. Apparently, the glass and digitizer in the 3G are no longer glued to the LCD as they are in earlier models, so this repair is much easier and cheaper to do yourself. Thanks, apple! go to Charles's site--www.iphixiphone.com--and let him fix your cracked screen! he really is a lifesaver! he does an amazing job!!! I can fix any iphone screen for just $90!! just visit my website at iphixiphone.com and fill out the form at the bottom of the page. I can do shipping from any part of the country so don't worry about your location. this is a much cheaper plan than buying a whole new phone!!! i can fix anyone's broken iphone screen for $100 please call me at 9859747670 and we could work some kind of agreement out about shipping to me for repair. i dropped my iphone 3g and cracked the screen a few days ago. i went to the genius bar at the apple store here, cried my eyes out and asked for the manager and i got a new one. for FREE. good luck! That is a great question Spencer, I have been wondering the same and see that scaping the glass may be an option. However, I would like to know what exactly is the digitizer? Is it a separate peice from the lcd? I understand the concept of the glass and the lcd, but is the digitizer sandwiched between or part of the lcd? I have the same problem as you all. I have 2 iPhones with cracked screens that need to be replaced. On ebay there are 2 options that you can buy. 1, is getting a glass screen around $20, 2 is buying a digitizer with a new screen for about $150. My problem is, is that the digitizers work on both iPhones but the screens are cracked not allowing you to use the touch feature everywhere. Now, I looked on YouTube trying to figure out how I can replace the screens without having to buy the digitizer with the screen. In all the videos it shows that the screens are being replaced with the digitizer. Is there anyway you can replace just the glass screen without getting a new digitizer. I'm an electronics consultant, and after reading these blogs, I felt compeled to explain a few things. As of today; November 11, 2008 the iPhone 3G CANNOT be unlocked. The iPhone Dev Team is working around the clock to make this a reality, but not yet. Why should this matter? Until the 3G model can be unlocked, the original iPhone will still be worth more to anyone in many ways. First and foremost, everyone needs to understand that both iPhones are the SAME except for two features. Physically, the iPhone 2G (original) is thinner than the 3G, the 2G is made with a metal backing, where the 3G is plastic. Both have the same screen, same operating system, etc. The ONLY real difference is that the 3G model has two extra chips (which is why it's thicker). These chips offer 3G connectivity and assisted GPS. The iPhone 2G also has GPS features, but it's software based and not quite as accurate. Now, why am I explaining all this? Because if it costs $200.00 to fix your iPhone 2G glass, do it. That a great deal. Look on eBay folks. The 4 gig iPhones are going for an average of $250, the 8 gig's average (depending on condition) $350 to $450 and the 16 gig models go for as high as $750!! These prices are all for the 2G models. Why? They are unlockable, they are, as mentioned above, the same as the 3G models with the exception of two features. A friend of mine has an 8 gig iPhone using T-Mobile prepaid. I used a T-Mobile prepaid SIM in my iPhone on a recent trip to Europe. Yet I never signed a contract, agreed to $100 plus a month for a mandatory two years. Think about it folks. You can replace just the glass with a little patience and time. I replaced two and they work great. Basically a thin razor blade, silicon glue and a replacement glass(about $25 with shipping on ebay) The most important thing is to take the glass off in small pieces with out applying pressure and the other is to only put a little of the glue on the top and bottom black parts. Then apply constant light pressure on the screen to make sure it is touching the didgitizer, then apply the same glue to the all aound the edge of the unit where the seal went and bingo you in business. Once in a great while my phone won't register a touch, I just turn it off and on again and it works great. My iphone also has a cracked screen with ugly spider marks though it is still functional. Given the number of people with cracked iphone screens, doesn't it point to poor design and quality of this expensive phone? I don't mind spending $50 for a cracked glass screen, but $240 from Apple is a ripoff. I think we should have a class action lawsuit decrying the poor workmanship of the product! Join hands together guys, let us get Apple to be responsible for its product quality. Class action lawsuit, and let us spread the word. Also 3G isn't too much thinner, it's a pretty phone though. I got my 8G original iPhone from my brother cause he got 3G, and it's unlocked. But for a 3G off contract, you're looking at a good 700 bucks. 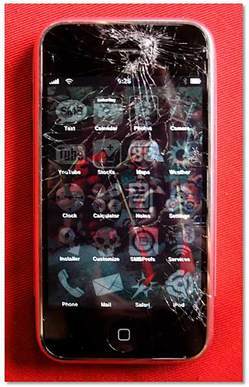 Google, "iPhone cracked screen." I found a link talking about fixing it for 5 dollars. Thinking it was for sure a scam I clicked it anyway. It tells you to take a razor and scrape off the glass and measure some thick solid plastic out to fit the screen and gives you instructions on how to put it in. The iPhone that was demonstrated looked flawless. Check it out. The only problem with buying a new iphone 3G to replace the old broken one simply because they're cheaper, is that they truely aren't cheaper. The new iPhone 3G's are going for $199 ONLY WHEN YOU START A NEW SERVICE. If you just want to update to the new iPhone without starting a new service plan its rumored you'll have to shove out the same price as the old one. Sorry guys. There is no point in fixing the screen for $199 becuase the new iPhone just came out for the exact same price. It is better, faster, thinner and cheaper..
Now that the new iPhone is $199, how can some one charge that much to replace the old one? If anyone knows of new prices for the replacement screen, let me know. Otherwise, I'll just buy a new one. Tough luck to all those overpriced businesses trying to fix broken cracked iPhones. I cracked my phone screen it's not really big scratch though but it has like one line scratch along the screen....you could barely tell but you feel it if you run your thumb through it. I'm sure why I'm telling you this. I'm sorry. We carry the complete replacement screen for the iPhone and not a replacement glass. The glass you are refering to is part of the complete screen with the lcd. You are unable to just replace the glass. Also the iphone screens we carry are OEM original replacements and not some after market knock off or just the lcd as seen on some other sites. The reason it will take 5-7 days to replace the screen for you is because we are so back logged on people sending them to us we can not keep up at this time. We have been offering screens for PDA and smartphones since 1997 and plan on doing it for a long time. We are most known for our free take apart videos and directions to show people how to DIY. Email me directly and I am sure I can help you get the screen done faster..